I’ve never been a big fan of Basecamp. There have been seasons where I’ve used it, with one team or another, or several projects on their own. And there have been times where I spent a couple of months using other apps from the company-previously-known-as-37signals. But Basecamp was never a huge part of my workday. At Wildbit, as a remote team, we’ve often struggled like so many others. Where do we store all of our stuff? And what goes where? Which pieces of information and which discussions need to be stored for the long term? Which do not? What is temporary and safe to be tossed away? We have used a combination of tools for various purposes. And we have enjoyed some new tools (Dropbox Paper) and some we most definitely have not (Honey). But we have continued searching for the right mix to get everything just so. The overall goal is to have a nicely organized collection of resources, one where a new team member could be pointed to and they would be able to spend their first week reading in order come away with familiarity of our collective organizational knowledge and a good sense of the culture of our team. As the Basecamp team rolled out this new version, I watched with interest. Their focus on how teams work is second to none. The features they’ve built appear to be targeted at exactly what remote teams need, in ways that enable them to do their best work. Examples would be understanding that a constant presence in live chat is not the best. Life away from work is just as important, if not more so, than life at work. And their focus is where so many teams struggle: keeping everyone in the loop at the right level with the right amount of information. After a couple of weeks of using it, I’m very much enjoying the latest iteration of this service. The biggest overall need we had as a remote team is “talking with each other”. Discussing ideas and efforts. Communicating. If you’ve worked remotely, you know how hard this can be. At any given time, for any given piece of information or idea, there can be a hesitation of how to share it with others on your team. Who needs to know this? How many people need to know this? Is this better in a group chat? Or a longer, more permanent discussion? If there will be some back and forth, will email fit the bill? Or should the discussion happen somewhere more permanent (email is not permanent on a group level) like a wiki? These are all the types of questions that go through your head. Basecamp does a nice job in that it provides all the necessary message types in version 3. Projects or teams can have Messages, a place to have threaded discussion that is stored for the long term. You have all the necessary formatting tools for the original post and comments added afterwards. As well, you can have the Chat tool included on any team or project. This allows discussions to happen at any time, but to be focused on the topic that fits where you're having it. And last, Basecamp 3 has an account wide private message tool called Pings. You can include multiple people in these messages, so it’s like a private DM in Slack. We haven’t fully jumped into all those options; we still use Slack as our primary chat service. However, I can see why Basecamp went in this direction (same with Metalab and Flow). Last, what we liked about Honey was that individuals chose what groups they wanted to belong to. As the person publishing something, you had only to choose the groups that fit what you were talking about. You never had to worry about “who needs to know about this?” Basecamp has not quite solved that, but the benefits around communication have been worth any small pain we feel there. The second most important aspect of Basecamp for me is awareness. Finding the right balance of being on top of what helps you do your job, yet without constant interruption, is hard. But vital. Basecamp excels here as well. There are in-app notifications (using the native iOS and Mac apps), as well as emails. You can choose how often emails come your way. And when you need time to focus, snoozing notifications, or turning them off completely, is an easy step (same as DND in Slack). Apart from that, another account wide feature is Hey. It lights up when there is something you should be notified about (replies to a message you posted, tasks assigned to you, the completion of tasks you assigned to someone else … these types of things). Last, there is the “Latest activity” view for an account. Click there and you see everything that has happened, across all the teams and projects you belong to. And Basecamp being the company they are, you have some great options. 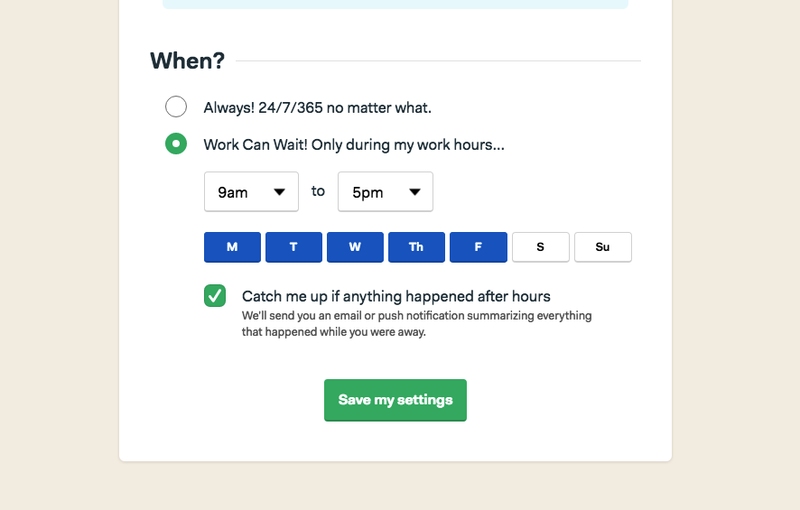 Work can wait is a setting that ensures you do not get any emails or notifications during the hours you specify. So my setup is that I have notifications disabled on my Mac, and work can wait is set to 7am–4pm, Monday–Friday. When I want to see what’s going on, I watch for the Hey to light up or check Latest Activity. This could also fall under “staying on top of things”. But for me, it’s an excellent way to stay on top of who’s doing things. As one who guides our Customer Success team on what we’re doing proactively, I’ve often struggled to get a clear picture of what everyone has on their plate. We used Trello previously. And while I could filter cards based on people and labels, I never felt comfortable with the end picture. With Basecamp, I save a bookmark for the Reports page, one for each of our team members (myself included). If I have a new tasks to assign, I can quickly review who has a very full plate already and who does not. There are several default reports, all well thought out. Again, I’ve never been one of those people you know who have been using the different iterations of Basecamp over the past 10 years. But something clicked with this version. It’s very solid and well thought out … like the past 15 years honing the previous versions helped the Basecamp team identify exactly how Basecamp should have worked all along. And how remote teams get things done together. Call me a happy (Base)camper.